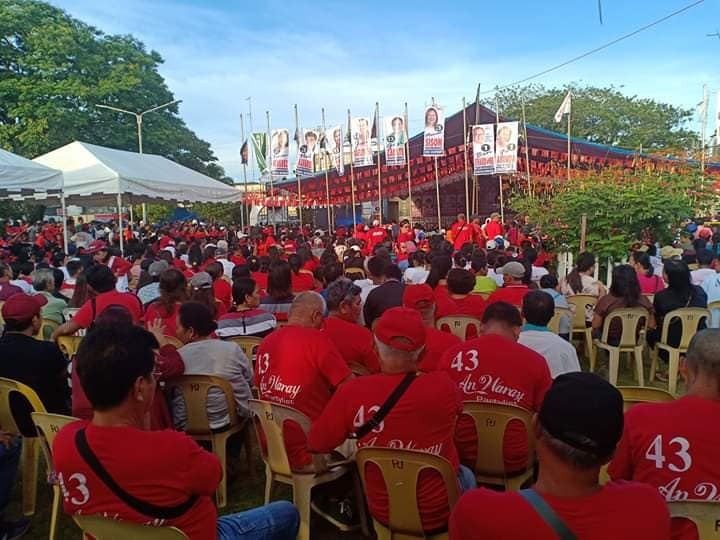 BORONGAN, March 30, 2019—Simultaneous rallies marked the first day of the campaign period for local candidates in Eastern Samar. In Borongan, people from all over the province gathered last March 29, for the proclamation of the PDP Laban’s provincial slate. Crowds of supporters clogged the streets during a unity walk, prior to the proclamation program at the city plaza. Dubbed “People’s Proclamation”, representatives from civil society organizations like PWDs, Farmers, Solo parents, Fisher folks and youth groups raised the hands of the party’s candidates. The party’s Team Performance is lead by Cong Ben Evardone who is running for Governor, Mayor Maria Fe Abunda, for Congresswoman and Board Member Maricar Sison, candidate for Vice Governor. In the southern part of the province, candidates and supporters of the Nacionalista Party joined a province wide caravan that ended in Guiuan for the proclamation of their candidates. The caravan caused kilometers long traffic because of the scores of vehicles that took part in the motorcade. Senator Cynthia Villar formally proclaimed their candidates, Mayor Christopher Sheen Gonzales for congressman, acting Gov. Marcelo Picardal, for Governor, and acting Vice Governor Jonas Abuda who is running for the same position. Both gatherings were a show of force and there was much fanfare as the parties tried to outdo each other during the first day of the campaign. Meanwhile, the Comelec is reminding candidates and their supporters to be mindful of election rules and regulations, especially regarding campaign materials. Comelec regulations state that campaign posters must not exceed the size limit of 2 by 3 feet, and must be posted in common poster areas. According to Atty Karen Cajipo, Provincial Election Supervisor, posting of campaign materials in light posts, trees, electrical wires bridges, health centers and other public structures is prohibited. Violation of these regulations will constitute an election offense. The Civil Service commission is also reminding government officials and employees against engaging in partisan political activities.